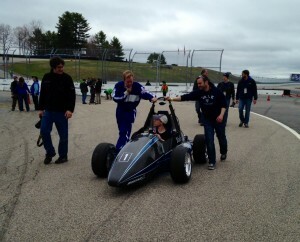 Yale’s first entry into a Formula SAE competition. The project was conceived under the supervision of Professor John Morrell, within a senior mechanical design seminar. The car, as a first-year entry, was very successful and came in 3rd place overall and also won the electric-only acceleration event at the inaugural Formula SAE Hybrid competition. Team’s first car after the inception of Bulldogs Racing as a Yale Undergraduate Organization. Designed to accommodate all the members of the team, including a 6’7” 300 lbs power lifter, the car was a mixed success vis-à-vis the design criteria and goals, but provided the team with invaluable know-how and experience at the 2007 Formula SAE Hybrid competition. BR10 was built upon the experience that the team gathered over the past two races, and was able to secure a 2nd place for the General Motors Award for Best Hybrid System Engineering. The team expanded its knowledge base on and experience with the hybrid drivetrains. The year when it all come together: BR13 won the Formula SAE Hybrid 2013 competitions, posting the fastest times in all dynamic events and garnering the Ford Most Efficient Hybrid Award (1st place), the Chrysler Innovation Award (1st place), and the GM Best Engineered Hybrid System Award (2nd place). BR13 ran the 75m acceleration event in an incredible 5.283 seconds and posted an autocross time of 49.417 seconds. Bulldogs Racing fielded BR14 as the defending champion. 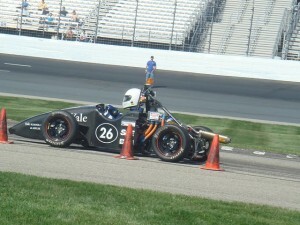 Due to difficulties with the clutch system, the car could not use the full potential of its internal combustion engine, and came in 4th place at the 2014 Formula SAE Hybrid competition. The team decided to focus more on the electrical drivetrains for the next competition cycle in order to learn more about the latest technologies in the automotive industry. BR16 was designed and built to be an all-electric vehicle, using a 180-Volt battery box and 2 Emrax 208 Motors. On the day prior to the competition, it experienced a fire in its Battery Box that gutted the internals of the car and rendered it unable to race. This prompted a completed redesign of the car with additional safety features.